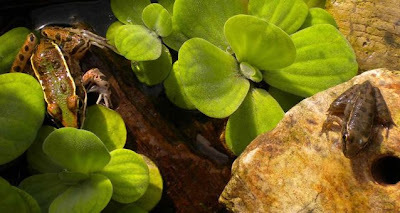 In late August of 2009 I was surprised and excited to find masses of frog eggs in my little pond so late in the season. It was easy to tell they were frog and not toad eggs by the fact they were in clusters and not in strings. I decided to save a handful of them before the fish ate them and I put them into a clear bowl and began to watch and photograph their story. I had just gotten my first little digital camera and was eager to use it. On the macro setting I could get close enough to really observe what was going on and it was such a treat to see how quickly the eggs changed hatched in only a few days. I had no idea how this would play out and was immediately drawn into the drama as it unfolded. I was hooked! It was a cold August that year. The nights fell into the 60's and even the 50's and so the water in the bowl did not stay very warm. The tadpoles were growing but research on the internet revealed that their development would require several more weeks of much warmer temperatures to complete. It became obvious that these tadpoles (I had no idea what kind they were yet) would not have time to complete their metamorphosis so I decided to keep two in a sunny window indoors and put the rest back into the pond where I found them. pond. I had never successfully wintered over water lettuce before but this time, it began to grow well in the more complete ecosystem with natural fertilizer from the tadpoles. I fed the tadpoles fish food pellets which they seemed to love. Inside the house in consistently warmer water, they began to grow much faster and bigger. I read that tadpoles that do not have time to morph before the temperatures get cold will remain tadpoles for as long as necessary, waiting until conditions are right, something that astounded me. Is frog DNA wise or what? The entire thing was so interesting I was enthralled and watched them constantly. Everyday there were differences and changes. By the beginning of December, one tadpole had developed into an adorable baby leopard frog and came out of the water. The other tadpole was still a large tadpole showing no signs of morphing. I believe that was because the habitat was very small and this was nature's way of making sure one or both would survive. How could two frogs find enough insects in such a small environment? (little did they know it would be provided by yours truly!!) It was a cold winter and I couldn't find any insects even on a sunny day so trips to the pet store to buy crickets became part of my routine. I kept the crickets in plastic jars with netting over the tops with damp egg carton cardboard to hide under and potatoes or carrots for food. I will never forget how "froggie" went after his first cricket and chomped it down. I was glued to this mini-drama. It was so exciting to watch the hunt! 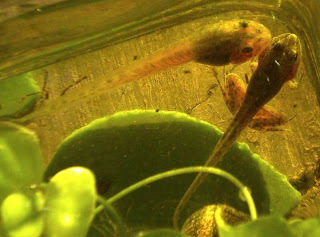 tadpole "nessie" finally morphed into a frog and both were eating several crickets a week. Everything in the habitat was thriving. The frogs, the mosses and other plants I added, and very importantly the water lettuce was multiplying like crazy. It was a mini tropical paradise in the middle of an Ozark winter, and the center piece of the living room. I rushed over to check it out every morning and spent many hours watching and taking photos. On the 26th of January, a very unexpected and delightful event occurred: the eldest frog, almost two months after emerging from the water, began to "croak"!! I never expected these creatures to be so interactive and so beautifully colorful and fascinating. I never expected to find it so enjoyable and so easy to raise them. No filters or air stones were necessary. I took out some of the water regularly and replaced it with our fresh well water weekly and once in awhile I siphoned out some of the gunk on the bottom. By late April 2010 when the temperatures were warmer, I reluctantly released the frogs into the pond. I saw the oldest one for several days sitting in the water plants before he disappeared. The smaller one "nessie" vanished after only a couple of days which was no surprise because that one was wilder and much more agile and active. Since releasing these two adorable leopard frogs into the pond, whenever I see leopard frogs in or near the pond, I always remember "froggie" and "nessie" and wonder…….. This photo essay of Southern Leopard Frog tadpoles was created by a Friends of the Kaw supporter, Peggy Madden, who lives in Arkansas. 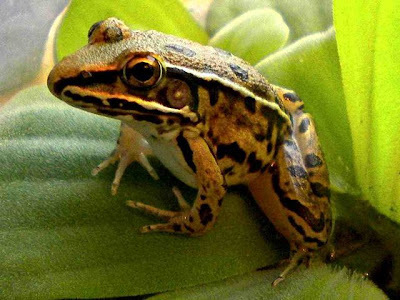 Can you tell which of our Kansas River frogs and toads is closely related to the Southern Leopard Frog? Kansas River frog and toad photos courtesy of Suzanne Collins. We would like to thank Joe Collins for his generous help.